A crash on the GDAX exchange temporarily rocks the Ether market and margin positions. GDAX announced June 23, 2017, that it would reverse a previous decision not to reimburse investors who saw stop loss orders on margin positions liquidate during a flash crash of the market days before. As per a blog post from GDAX, "We are confident that all trades this week were executed properly, however, some customers did not receive the quality of service we strive to provide and we want to do better." GDAX said it will establish a process to credit customer accounts that experienced margin call or stop loss orders as a direct result of the rapid price movement during the flash crash at 12:30 p.m. PST on June 21, 2017. GDAX said, "This process will allow affected customers to restore the value of their ETH-USD account to the equivalent value of their ETH-USD account at the moment prior to the rapid price movement." GDAX acknowledged that it will honor all executed orders for those who had buy orders filled and that no trades will be reversed in those cases. It will use company funds to credit those who had margin calls or stop loss orders. GDAX said it views this as an opportunity to demonstrate long-term commitment to its user base. Customers at GDAX can expect a direct follow-up from the exchange with the next week. Within the past day, the price of Ether fluctuated wildly on the GDAX exchange during an event being called a "flash crash" by market spectators and traders alike. Official statements from GDAX indicate the crash was the result of a multimillion dollar sell position posted to the exchange on June 21, 2017 at 12:30 p.m. PST. According to GDAX, "This resulted in orders being filled from $317.81 to $224.48, translating into a book slippage of 29.4%" – a slippage which initiated a cascade of around 800 stop loss orders and margin fund liquidations. The resulting impact on the price of Ether was staggering; for a split second, Ether was trading at $0.10. GDAX maintained in its announcement that the price drop was the result of automated trading and that "initial investigations show no indication of wrongdoing or account takeovers." Although GDAX stated it understood its customers&apos; frustrations, the exchange said its matchmaking engine operated as intended during the event and that margin trading carries an inherent risk. GDAX also indicated in the announcement that, while a continuing investigation is being conducted, all trades are final. Investors who had positions liquidated and who are hoping to be made whole will not be, at least not by the exchange. GDAX drives this point home by referring to section 3.1 of the its Trading Rules, which says that all fills are final and will not be reversed unless it is compelled to do so or there is a serious technical error. 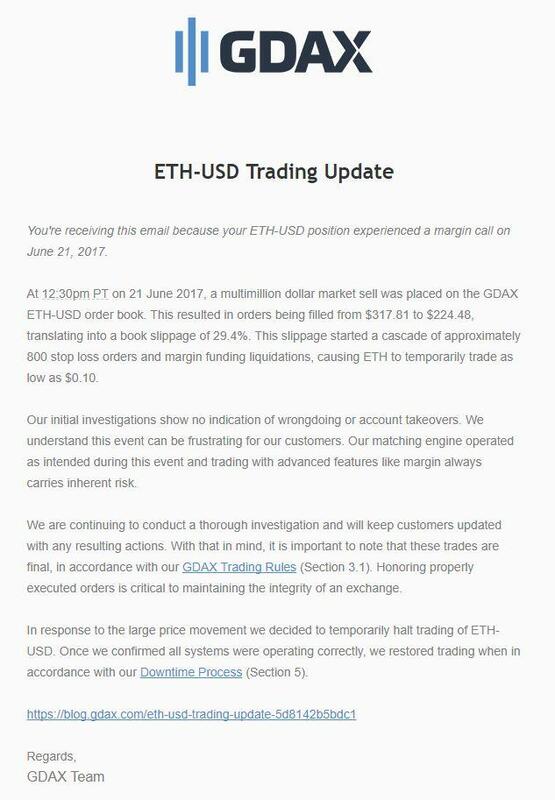 GDAX temporarily halted trading between ETH and USD until it "confirmed all systems were operating correctly." Trading was then restored in accordance with the "Downtime Process" (Section 5 of the Trading Rules). GDAX users expressed mixed feelings about the events which took place during the flash crash. On twitter, several investors demanded to be reimbursed. On reddit, at least one user took responsibility for their own inability to properly predict the market, admitting that margin positions are a gamble, and that the exchange need not be held accountable. This isn&apos;t the first time the ecosystem has seen large fluctuations that liquidated margin positions. In May 2017, the Kraken exchange saw a large sell order effectively tank the price of Ether, and speculation continues to revolve around another sell-off in April 2017. Like what you read? Follow us on Twitter @ETHNews_ to receive the latest GDAX, flash crash or other Ethereum wallets and exchanges news.